Find out how many of your visitors are. 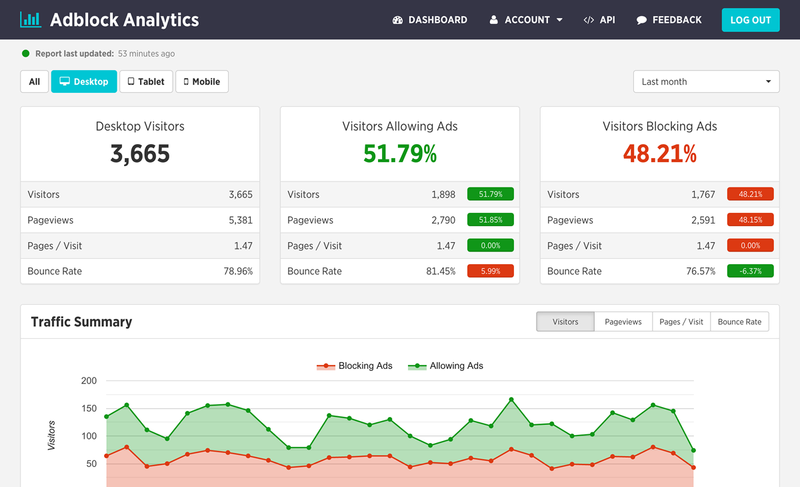 How can Adblock Analytics help you? Know with certainty how your business is affected by the usage of ad blockers. Find out the impact that ad blocking is having on your businesses revenue enabling you to make an informed decision on how your business will respond to this new technology. See exactly how visitors are accessing your website broken down by device type along with detailed platform information and which country the visitor is located in. We understand that you might not want to check another report so that's why we send your websites ad blocking data to Google Analytics so you can view everything in one place. Monitor ad blocking usage across your network of websites enabling you to see the full impact of ad blocking technology on your business along with no limitations on the number of pageviews they receive. Using our well documented and extremely simple to integrate API you can download your data to create custom reports for your organzation enabling you to perform your own analysis. Receive ad blocker usage statistics. Sign up to find out how big of a problem ad blocking is for your business. Ad blocking statistics are updated every hour. No obligation, no credit card required. Upgrade, downgrade, or cancel anytime. Sign up to stay informed on what's happening with Adblock Analytics and ad blocking technology.